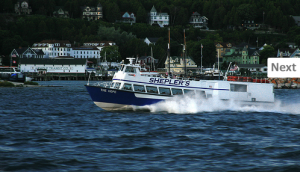 This summer John Michkowski, captain of the Foxy Lady Cruises in Green Bay, Wis., limited his passengers to 137 a trip. That’s down 12 passengers that he previously took on trips along the Fox River and Green Bay. The reason is that the U.S Coast Guard now says boat tour operators like Michkowski must consider that the average weight of a person is 25 more pounds than previously estimated. 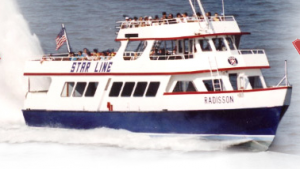 Many tour boat operators find it difficult to comply. They either have to upgrade their vessels or lower how many passengers they carry. The Coast Guard says the increase is a safety measure. The rule went into effect last December. It requires boat owners to consider that the average person weighs 185 pounds, updating the 160-pound estimate set in 1960. The new weight is based on a 2004 Center for Disease Control and Prevention study indicating that on average men and women are about in inch taller and 25 pounds heavier then they were fifty years ago. While Michkowski endorses safety, he is not fond of some parts of the rule. It costs thousands of dollars to expand his boat decks to carry more people, he said. “And the proposal to put people on a scale as they come on board is not really practical either,” he said. Commercial boat operators can weigh passengers rather then assuming that each of them weigh about 185. That seems unlikely to happen. North instead uses draft marks on the bottom of each boat. When they go under the water, the vessel is full, he said. The company downsized the number of passengers it carries from 335 to 317. Some tour operators are frustrated. Reducing the maximum passengers they can carry reduces revenue whenever they are full. And they are unconvinced of safety gains. North estimates his company could lose about $1,300 per day when boats are at full capacity because of the requirement. To carry the same passenger as before, his company could conduct a stability test. But that also costs thousands of dollars. Star Line Mackinac Island Ferry already upgraded three boats to match the new standards. It has another two boats that need to undergo a stability test. The Coast Guard requires such tests for boats under 65 feet long. The test requires loading 55-gallon drums of water in various locations on the vessels and moving them to one side to simulate what might happen in strong waves. North doubts that his company will conduct the test any time soon as the upgrades of a few of his boats are expensive and not worth the revenue from the additional passengers they might allow at capacity. In many trips his boats are not filled to capacity, so expanding them doesn’t justify the costs, he said. It is easier to downsize passenger capacity than buy a new boat, said Daniel Dickinson, captain of the Magnolia Blossom Cruises in St. Paul, Minn.
“I don’t think this rule was necessary for us, but we have to comply with it to our best,” said Dickinson, who operates tours on the Mississippi River near St. Paul and Minneapolis, Minn.
His boat can safely carry 149 passengers, Dickinson said. But the new rule limits it to 110 now. “We lose about 39 percent of our annual revenue, but to extend the boats will cost us much more,” he said. The change was prompted by a couple of fatal tour-boat accidents, including an October 2005 incident in Lake George, N.Y that killed 20 people, according to the U.S Coast Guard. A boat named the Ethan Allen rolled over as it was hit by waves. An investigation showed the boat was supposed to carry only 14 passengers instead of the 48 who were on board, the federal agency noted. The Ethan Allen boat sank because of violating a simple safety rule, but there are hundreds of other boats that have successfully operated for years, Shepler said. This rule shouldn’t apply to those operators, who put passengers’ safety as the number one priority, he said. Shepler noted that the rule cost him 15 passengers a trip when fully loaded. At the peak of tourist season that could be nearly $1,500 a day. I agree with Bill in that this shouldn’t have been coming around because of an obvious safety violation. However, it is an obvious truth that the numbers from 1960 are out of date. People are much heavier than they were then. 25 pounds is a good heavy suitcase. That’s like throwing an extra school group cart on each boat.This is a matter that was long in need of review, and despite changes in capacity I know that the boat-lines will keep chugging along and continue to deliver exemplary customer service. There it is again, that 5 letter word, MONEY. The tour boat owners lament the $1300 to $1500 a day that they can lose if fully loaded. Now if, just if, a sudden squall were to appear with high winds, and if a tour boat were to overturn with loss of lives, would the boat owner lament the loss of life? Would he accept moral responsibility or just say shat happens and let his insurance company take the hit? Most of the time, rules, regulations and guidelines are there for a valid reason, but, those of a particular political philosophy chafe at being told what is best when the almighty buck is at stake. Most boats are rated at so many person capacity, or a max load weight of so many pounds. If, in the past, 150 people was less than the max load weight the boat was good to go, but, if now 150 people exceeds the max load weight, then proceeding puts everyone in jeopardy.